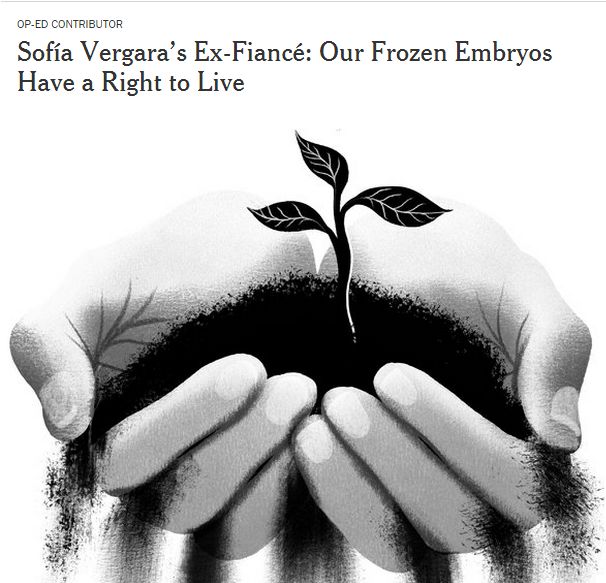 On April 29, 2015 Nick Loeb, actress Sofía Vergara’s ex fiancé, published an op-ed in the New York Times outlining why he should be able to bring their frozen embryos to term against her objections. I am thrilled to welcome Macey L. Thompson Henderson, JD, PhD (ABD) to Pop Health today to discuss the bioethics and public health implications of this case. Question: From your perspective, what are the key bioethical considerations in this case? The principle of respect for autonomy involves respectful action as well as attitude. Beliefs and choices shift over time and problems can arise when a person’s present choices, desires or actions contradict previous choices. The ethical question to ask over the principle of autonomy in frozen embryo cases would be: “Is this person autonomously revoking their prior decision?” Informed consent is inherent to the ethical principle of autonomy. The media coverage of the present case itself could very well be considered an ethical issue. What is the role of the celebrity voice in raising public health awareness? It would be my hope that can we use this legal dispute to engage the public in a thought provoking conversation about prevention and advance planning for all areas of one’s healthcare. Nick Loeb’s ability to coin a New York Times OpEd and to subsequently gain publicity across international media outlets about a personal issue he admittedly originally intended to keep private could be examined with an ethical lens as well. I find it interesting how the timing on Loeb’s personal revelations directly coincide with the release of a new movie starring Sofia Vergara. Question: Loeb writes, “When we create embryos for the purpose of life, should we not define them as life, rather than as property?” Should a couple’s intentions at the outset of IVF impact how embryos are later defined? Why or why not? American courts have never deemed frozen embryos as children. Frozen embryo case law appears to follow a logical and straightforward application of the abortion cases which the United States Supreme Court has upheld. The rationale for upholding these cases is based on a mother’s right to privacy and control over her own body versus any right of a nonviable fetus. Media coverage seems to focus less on the debate about the classification of embryos as property versus children and more tuned into reproductive choices in general. I am happy to see a trend where the reproductive rights and decisions of all adults are valued and the conversation about parenthood choices have been promoted by various celebrities and media personalities. If the question really becomes about a “right to life” for the frozen embryos versus the “right to parenthood with Sofia Vergara” for Loeb, we could begin the public discussion about embryo adoption versus destruction which has more ethical implications. Question: Loeb writes, “In my view, keeping them frozen forever is tantamount to killing them.” These are powerful words. In using them, he addresses a long-standing ethical debate regarding when life actually begins. How should this debate be addressed in the context of this case? I don’t agree that Loeb actually addresses a debate about the beginning of life with his claims that keeping frozen embryos are tantamount to killing them. Instead, I think Loeb opens the door for us to discuss important processes and educational efforts (including basic education about contracts) that should be in effect before people utilize assisted reproductive technology to aid infertility, delay parenthood, or for any other reason—medical or not. This is an opportunity to explore these public health communication opportunities from the perspective of patients, providers, and the public surrounding assisted reproductive technology. Loeb’s point makes me think about the ethical issue of post-mortem sperm retrieval. Is killing involved if you fail to procure a man’s viable sperm after death for potential fertilization of future embryos? What are the impacts on the future child and society? Question: In thinking about this from a public health perspective: what system or policy-level changes could/should be made in reproductive health technology to avoid these types of disputes in the future? Assisted reproductive technology has left areas of American jurisprudence shuffling between gaps in family law, constitutional, statutory, and common law over family decision-making rights. Courts will remain key players in the debate in absence of state legislation. Is legislation always the best thing? Many would argue that unless contracts go against public policy, there is no need for the government to interfere. Parties in a contractual agreement can even agree to follow the laws of different states (which is common), therefore it can be challenging to get consensus on how much government involvement is necessary. In this case Loeb wants to void a contract based on a procedural problem with a form. “We signed a form stating that any embryos created through the process could be brought to term only with both parties’ consent. The form did not specify — as California law requires — what would happen if we separated. I am asking to have it voided.” This is where a public health perspective is important. There can be more attention paid to how healthcare forms are created and evaluated. Standardization of forms at the state level could help these types of challenges in the future. Health communicators can aide in providing patient education about all health planning, whether for reproductive and family planning or other types of advanced care planning like end of life care. It is obvious that Loeb and Vergara are “lawyered” up and that their celebrity status aids their ability in resolving these disputes especially with the public watching. I am more concerned about the couple in small town USA who might be going through a similar thing without the same resources. I think we have the duty and obligation to take celebrity cases involving health care decisions like this seriously in public health because we often fail to realize that television is one medium for which many individuals consume health information. Macey L. Thompson Henderson, JD, PhD (ABD) is a Health Policy and Management PhD Candidate focusing on implementation science and donation and transplantation. She has a law degree and extensive training in bioethics, data science, and public communications. Finding ways to utilize patient voices, media, and technology to improve living organ donor follow-up care is the focus of her doctoral dissertation. She currently teaches bioethics and health policy to public health and medical students. You can connect with Macey on Twitter and LinkedIn. It is frightening to think that celebrities (and their advisors) lack the forethought to address the very question posed in this case: What happens in the event of a dispute between the contracting parties? I appreciate Ms. Henderson's thoughts and urge us to ramp up the conversations about these issues.